Ancestors of the Bernese Mountain Dogs were brought into Switzerland more than 2000 years ago by forces of invading Roman soldiers, and although they can still to be found on the farms of central Switzerland today, by the end of last century the breed had degenerated to such an extent as to be unrecognisable. 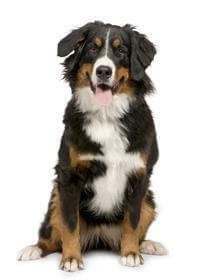 The Bernese Mountain Dog was mainly used as a drover's dog and a watchdog in the farmyards in the Canton of Berne. Sufficient dogs of correct type remained for a rehabilitation programme to be undertaken by fanciers and by 1907 a breed club was formed, and the breed found favour with many Swiss as a pet and companion. A male dog in peak condition should be about 50kg and be 70cm tall and the female should be 34 to 40kg and up to 60cm tall. Because of the Bernese Mountain Dog's strong in-built herding instinct can quickly turn into a dangerous chasing habit if not curbed. Because they are tempted to round up any moving object, this can include traffic - so train your dog to understand that ‘traffic herding’ is not allowed. Because these dogs can grow so quickly and are extremely active, they are usually too ‘full on’ for very young children and elderly folk. Their herding instinct can also make them a problem for the young.